Travel Takes Me To Bliss-ful-ness! 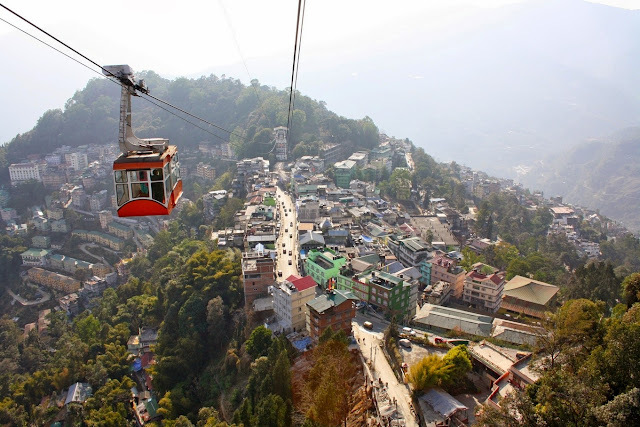 The place: Gangtok, capital of the Indian state of Sikkim; situated at 5800 feet (1800 m) above sea level. Why would one want to visit: Perfect hill station with mild-temperature climate throughout the year; views of the Himalayas; Buddhist monasteries; Hindu temples; nearest focal point to Nathula pass (India-China border) and Changu Lake (also called Tsongmo Lake). 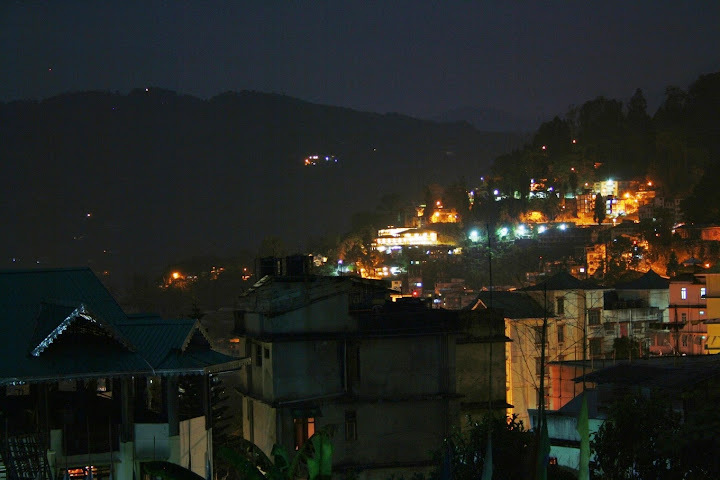 Gangtok was the second point of my Sikkim expedition. Another hill station – yes, getting bored of hills and mountains - never. The number one reason why I was particular about visiting Gangtok – the Nathula pass which would be covered in snow. I have never seen snow in my entire life (being from an equatorial tropic place) and I thought yeah, this time, it’s gonna happen. I started where I paused at the end of my first point, Dzongu. Took a share taxi from Mangan and reached Gangtok after a drive of 2.5 hours. I checked in at Mintokling guesthouse (with a silent k) at 5 pm. I had selected Mintokling after a series of review readings on the internet. Lonely Planet said it’s good and Trip Advisor had impressive reviews. I contacted the manager Ms. Pema Pulger by email, paid Rs 1200 as advance as instructed. She was way too helpful in answering all my queries. [Tip] Winter is off season in Gangtok and hotels offer up to 50% discount but only after bargaining. Let them know that you are well aware of the discount practice and ask for it. After settling in and taking rest for an hour, I moved out to check out M.G. 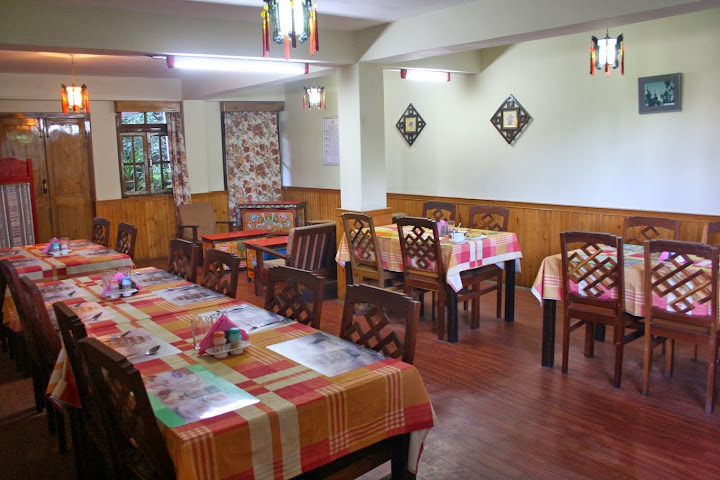 Road, the most happening place of Gangtok which was at a 10 minute walk from the hotel. I have seen vehicles-restricted roads in all major hill stations I have visited and M.G. road is the classiest among them. Interlocked bricks paved road, fancy street lights on the median, benches on both sides of the lamp posts, new and old illuminated buildings on both sides, beautiful people – families, couples, kids, all in trendy coats and boots. I spent at least an hour walking from end to end and back until I was hungry. Had dinner from Chopstick restaurant, my trade mark butter tandoori roti and butter chicken. I’m not impressed by my reluctance to try out the local food whenever I travel but I find it tough to change. I think I’m too afraid of getting a sick stomach!. Out of curiosity, I ordered for Tibetan tea post dinner. It was salty! So a word of caution here, Tibetan tea by default contains salt and if you don’t find it cool, please go for some other kind, they are in plenty. Got back at room by 9 pm. The care taker asked me when would I want the breakfast next morning, I said 10 am would be fine. I called it a day soon. The breakfast was grand. Tea was not salty!. I spent the first half of day 2 rediscovering M.G. Road and arranging my Nathula pass trip. For the latter, one needs to produce copy of an ID proof and 3 passport size photos. Any recognized tour operator can get the permit ready for you. Post lunch, checked out the rope way. The views were amazing. Vehicles that look like little bugs, mighty hills, mountains far away, it was a well spent 20 minutes. The charge is Rs 70 for the end to end trip. Dinner that night was from Gangtalk, one fine restaurant on M.G. Road. Really nice ambiance and awesome Chinese food. There ended day 2. I was asked to report at the Vajra taxi stand at 8’o clock next morning for the Nathula pass trip. Reached there on time but my taxi started after one hour. Didn't mind that much, it was anyway a new place and there was nothing wrong with walking around and getting a fresh feel. From now onward, it is best not to write much, the pictures will say everything. Enjoy! We were able to spend around 30 minutes at the pass. Started the journey downhill. The legendary Tsongmo lake is at half-way. The view of the lake frozen was beautiful, never seen such a huge body of frozen water! Kashyap and Sweta, the awesome couple celebrating their anniversary! The lake was one of the best places on planet Earth I have ever been. It's just the nature at its best and you, nothing else in between. We spent another 30 minutes at the lake, then resumed our way down to Gangtok. The effects of the 2011 earthquake could still be seen all along the way. We reached Gangtok at around 5 pm. Went straight to the hotel, lied down, revisiting the amazing day. [Tip] From Gangtok to Nathula pass took 3 hours, one way. Carry heavy woolens in the winter. 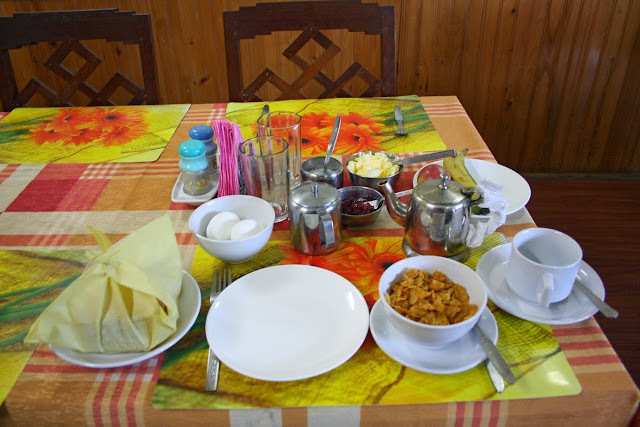 Have breakfast before you start from Gangtok in the morning, lunch can be managed at Cafe 14000 right at Nathula pass. Went out, again to M.G. Road for a final night experience there. It was so welcoming and beautiful, just as I left it last night. After another relaxing sleep, got up at around 8 and had the same awesome breakfast. Went down to the taxi stand to book my shared taxi back to New Jalpaiguri. They charged Rs 200 per seat. Came back to the room, packed bags, watched TV for a while, got ready and checked out. I had spent 3 nights at the hotel and the total cost was Rs 3600 including all the breakfasts (Rs 1200 per night). Worth every paisa! There ended the Gangtok part of the never ending travel. Totally satisfying - that is how I can describe it in minimum words. The most beautiful people I have ever seen in my entire existence was on M.G. Road. My first snow experience was at Nathula. And the only place where I have ever had salty tea! So there are plenty of reason why I will never forger Gangtok. And I'm sure that all these will push me in the future to come back to Gangtok. I wish it happens. Hey, I'm Alen, a hell of a travel addict who wants to be at 10 different awesome places at a time. My purpose with this blog is to share my travel experiences, inspire people to travel and help fellow travellers. Read on! © Happily Travelled 2013. Powered by Blogger.